Kathleen Ryan, Bacchante (Tall White), 2016, concrete, marble, stainless steel, 94 x 55 x 42". Los Angeles–based artist Kathleen Ryan’s sculptures are big and bold—seemingly hypertrophied in the life-altering California sun. She uses functional, everyday items salvaged from thrift stores and junkyards—curtain panels, railings—and reconfigures them with slick and subtle gestures. For example, Lipstick Rail (all works 2016) is a bent, upended, fire-engine-red railing, which resembles a giant line of the titular makeup, drawn in three dimensions. 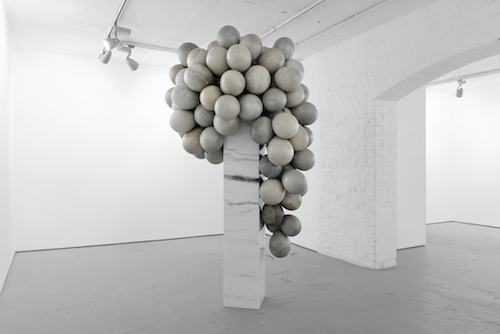 In Bacchante (Tall White), countless concrete spheres, like an oversize cluster of grapes, tumble from atop a pristine marble column, ready to burst. Their smoothly polished surfaces, mottled in varying tones of gray, from pale pebble to rich slate, glimmer. Fecund and sensuous, they summon forth the Greco-Roman deity of wine, madness, ecstasy, and fertility. Further classical references appear in Untitled. Ivy is cast in pewter, complete with delicate capillaries, and woven to form a huge metallic wreath. And Caprice recalls Botticelli’s The Birth of Venus, ca. 1486: a pale pink clamshell opening to reveal a pearlescent bowling ball that’s replaced the serene goddess being blown to shore. Ryan’s materials can be hard, shiny, and cold. But with the artist’s playful and charming tweaks, they go beyond Minimalist aesthetics. The ways Ryan transforms the strange beauty of junk reminds the viewer that common objects can become scintillatingly uncommon if you consider them thoughtfully and for long enough.